See, this is what Jurassic Park should've done. — U.S. Acres, "The Name Game"
Well, it's true. Dinosaurs are cool. No exceptions. Since dinosaurs actually existed in the past, some writers like to throw them into their stories. In many cases, this makes no sense at all, but when dinosaurs show up, we're generally in the realm of awesome for the sake of awesome. Generally, the dinosaurs seen will be restricted to a few well-known types. The essence of this trope is the presence of dinosaurs which are not ultimately critical to the plot. If the story would be essentially the same without dinosaurs, it's an example. On the other hand, if dinosaurs are integral to the premise, it's not an example. Note that just because a series provides a reason for there to be dinosaurs does not mean it isn't an example of this trope. Sure, a dinosaur altmode might very well be a good idea for a Transformer, but the real reason for a dinosaur form is to appeal to young boys. Despite the name of this trope, it can cover examples that are not technically dinosaurs. Other extinct reptiles, like pterosaurs, plesiosaurs, and dimetrodons would fall under this trope. And while it may be a stretch, since we don't have individual tropes for Everything is Better with Woolly Mammoths/Woolly Rhinos/Saber-tooth Cats/etc., these examples would get grouped here. See also Dinosaurs Are Dragons (in which case this trope overlaps with Instant Awesome: Just Add Dragons!) and Artistic License  Paleontology. Compare Dinosaur Media. In Happy Heroes, among the wildlife roaming around planet Xing Xing are dinosaurs (primarily Tyrannosaurus rex), for no other reason than just because. Motu Patlu has an episode titled "Baby Dinosaur", where Patlu finds a dinosaur egg and keeps Motu from trying to cook it. The dinosaur, who they name Chotu, causes mischief around town, and Motu and Patlu try to find him. In the Simple Samosa episode "Comic Book", Jalebi is writing a story about her friend Samosa, and Vada and Dhokla make their own additions to the story. Suddenly, the mayor issues a warning for all of Chatpata Nagar, and the three abandon their story to investigate. As it turns out, Samosa has turned into a dinosaur who wants to take some people with him - and not in the story his friends were writing. This turns out to be because the events of the episode were all written by Samosa, and he wrote himself in as a dinosaur just for fun. Calvin and Hobbes: The Series downplays Calvin's love of dinosaurs (though it still exists). Nonetheless, Hobbes ends up in their era in "Time Terror". Zig-zagged to Hell and back in Rise of the Galeforces. The heroes are threatened by a T. rex, then they befriend a genetically engineered Ptero Soarer, then they fight raptors, then they encounter animated dinosaur fossils, then they visit an island full of dinosaurs, then they get attacked and separated by the dinosaurs, then one of the heroes gets the ability to transform into a dinosaur, and it gets a whole lot weirder from there. Violet: [to Adam] No more dinosaurs for a while, OK? Pinkassic Park , which is basically My Little Pony: Friendship Is Magic crossed with Jurassic Park. The World Of The Creatures takes place in the mind of someone obsessed with dinosaurs and other extinct animals. When they're not trying to save the world, the main characters are usually trying to avoid being eaten. The entire reason Mesozoic Effect exists. According to the author the idea of putting sentient dinosaurs into the Mass Effect universe was just awesome not to write about, regardless of how little sense it makes. The Fighting Fantasy gamebook Island of the Lizard King involved the reader trying to assassinate the king of a race of lizardmen. For no particular reason, one of said lizardmen is seen riding a Styracosaurus at one point. Hevisaurus, a Finnish Heavy Metal band aimed towards children. "Weird Al" Yankovic's "Jurassic Park," turning the melodramatic (to the point of hilarity) "MacArthur Park" into a retelling of Spielberg's movie. 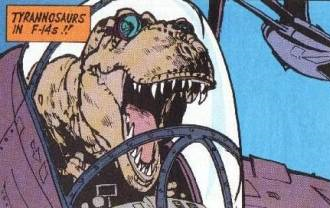 Calvin and Hobbes gives us Tyrannosaurs in F-14s, as you can see on this page. Calvin: This is so cool! Hobbes: This is so stupid. Jason Fox of FoxTrot has a major dinosaur obsession. He once sent an electronic message to the White House saying "increase dinosaur DNA research" over and over again. In Dilbert, dinosaurs aren't extinct; they're just hiding in your furniture. Bob the Dinosaur managed to evade humans for years thanks to wearing tennis shoes for fast running. All of the "fossils" that are discovered in modern times were purchased at dinosaur prank novelty stores and thrown into tarpits just to fool people. The Far Side used dinosaurs (together with cavemen) as a common subject. In fact, the scientific name for a stegosaur's tail (thagomizer) is derived from a comic where a caveman explains that it is derived from "the late Thag Simmons". Atari's Middle Earth pinball is decorated with space explorers taming a dinosaur-filled Lost World ... none of which affects the actual game one iota. Hankin's The Empire Strikes Back has a pterosaur flying over Dagobah. Why? Why not? The Bronto Crane from The Flintstones, a fancy way just to return a ball back to the playfield. One of CHIKARA's big annual events is Chikarasaurus Rex. Brodus Clay's Red Baron is "The Funkasaurus." Ellen's Energy Adventure at EPCOT, which is about power sources, contains an extended sequence involving dinosaurs. This in itself was based on the Primeval World diorama at the Disneyland Railroad. There's also the ride called Dinosaur. Big Thunder Mountain Railroad ends with a stop at a dig site where a Tyrannosaurus skeleton has been uncovered. And lest we forget the Disneyland Rail Road's journey through the Grand Canyon, which suddenly takes us back to the time of dinosaurs. Jurassic Park River Adventure at Islands of Adventure, is of course based off the franchise Jurassic Park. Besides the ride there is a whole island based around the franchise as well. The ride by itself is present in the other various Universal parks as well. The primeval sequence in Back to the Future: The Ride features an up and close encounter with a massive T. rex. A whole section of The Simpsons Ride is dedicated to an attraction called "Captain Dinosaur's Pirate Rip-Off". Lee in SourceFed loves dinosaurs. This little fact turned into a Running Gag of epic proportions. Tier Zoo did an episode that discussed how well dinosaurs would do in the modern day. It turns out that several dinosaurs including the Triceratops and Tyrannosaurus rex would be considered Awesome, but Impractical thanks to the differences in wildlife back then and now. Dromaeosaurs, Stegosaurs and Ankylosaurs would be able to dominate the meta thanks to still having the tools needed to survive.